How to Make an Ebook in 4 Easy Steps - Get Published! The electronic book industry is growing by the day and slowly replacing printed literature. If you’re looking for an easier, cheaper way to publish a book – you’re in luck. In this tutorial, you will learn how to make an ebook in four easy steps. Almost everyone has digital devices on their hands. Due to this, ebooks can be accessed anywhere at any time. They’re easy to download and store. Readers don’t have to go to a book shop to get the reading materials they need. When creating ebooks, you have full control of the process. You can design and edit them however you want. Furthermore, since electronic books are created digitally, they’ll cost less. You don’t have to search around for publishing companies as you can simply upload your book online. That won’t cost a dime either if you’re posting them in your website. Did you know that with 000webhost you can create a website for free? Or you can publish and sell your electronic book in markets such as Kindle or Kobo, earning money along the way. Depending on what you want your book to be – you need to pick your topic and write the content. An electronic book, just like a regular book, can be of any topic, style, and purpose. It can be anything from fiction, non-fiction, to business or health, depending on what your goals are. Once you’ve got a good idea of what topic you want to write about, the next step will be creating the content of your electronic book. For this, you have full authority on how you’re going to write the content. Writing an electronic book from scratch does take time, from the planning process to writing the content. Don’t be disheartened, you’ll end up with a unique ebook that will catch the readers eyes. If you have an existing blog or website, you can write an ebook using your posts. Either by using the most popular posts or by compiling multiple articles under the same category into one book. This is one of the easiest ways to make an electronic book. Whichever method you choose, a successful digital book is the one that’s planned well. Having a good outline can prevent you from writer’s block and ease your proofreading. PDF ‒ stands for “Portable Document Format.” The most well-known file type and the most straightforward choice. Best for ebooks read on digital tools (computers, tablets, smartphones, etc.). AZW ‒ an ebook file designed for an Amazon e-reader, Kindle. But users can open the file on any other smart devices. EPUB ‒ Electronic Publication is the most flexible format and is most preferred by digital publishers. The text alignment can adapt to various devices based on the size. MOBI ‒ used for Amazon Kindle, and Kindle apps for iOS and Android. The format is visually appealing as it gives the sense of reading a physical book. iBook ‒ an exclusive format for electronic books sold at the Apple iBooks store. It’s built using the EPUB standard but has restrictions. The format is incompatible with standard EPUB readers. ODF ‒ Open Document Format files are primarily for OpenOffice, a series of content creation programs that are open source. After deciding on the type of file your ebook will be converted to, you want to choose the software to create it. There are many tools available both online and offline that you can use. Writing your ebook online and converting it to the PDF format for free can’t get any simpler than with Google Docs. Just type in your text and edit it however you want, from the font to adding in images and other media. Once you’re happy with the end result, click on File -> Download as -> PDF Document (.pdf). Another great point is that it syncs with your Google Drive account. Hence, you can work on your content anywhere you are and with any device, as long as you’re online. Who isn’t familiar with Microsoft Word? Anyone with a computer can operate it just fine. So if you’re the type who doesn’t like learning new software, then this is a great tool to create your ebook. In MS Word you can design your electronic book from scratch or choose from the available templates and tweak them around. Press Ctrl+P to open the Print Screen. Click the Printer list, scroll down and choose Microsoft Print to PDF. Click the Print button. Nothing is printed on paper, but the document is saved to a PDF file. Open Office is desktop software that is entirely free to use. It’s similar to Word so you’ll be typing away your content and will be done with it in no time. Once your ebook is ready, simply go to File -> Export to PDF, converting your .doc file to .pdf file. Publish Xpress is the perfect online software if you have your ebook document and cover ready. Converting them to readable files for e-readers, MOBI and EPUB, isn’t a hassle. Type in the required field that consists of Title and Author, then upload your files. You can add in the Advanced Options such as the ISBN number and the Tags for your ebook, but it’s all optional. Then all you have to do is click the Convert to .mobi and .epub button. The online tool is free, and do keep in mind that once you’ve converted your ebook, you need to check for inconsistencies in the format. To edit the MOBI or EPUB file you need another software, Calibre, which we will discuss later. If you’re looking for the best electronic book creator for diverse writers, then Lucidpress is your choice. This online tool has a wide range of formats and upload options. The interface is very well laid out, making it painless to navigate around. You can register for a free membership or the upgraded version with a free trial. If you’re in the education field, you can get a better service for free than the individual membership. So how to create an ebook using Lucidpress once you registered? Go to My Documents, then click on the +Documents button or the + blank page button if you want to start from scratch. Pick the template of your taste and click Create New. Create your ebook content and cover using the intuitive dashboard. Once you’re finished, select the Download button and drop down the Format list and pick PDF or image files. Customize the other options, then click Download. If you have a WordPress blog, you can easily turn your blog posts into e-books using the free plugin, Beacon. It converts blog posts to PDF format, and you can filter the articles by category or choose the ones you want to include. So how to use Beacon? Register and create a free account at their homepage. Install the plugin in your WordPress. Click the Connect button to connect the plugin to your Beacon account. Pick the posts that you want to be published as an ebook. Click Create and select ebook. Choose a theme and get creative. Select the Generate PDF tab, then download your PDF file from your Beacon dashboard. Calibre is an ebook management software and viewer that you can install for free. It can convert between PDF, EPUB, MOBI, and other ebook formats. Other than that, you can organize your ebooks into a library using the tool. The software has a user-friendly dashboard, so it’s great for beginners. Moreover, you’re able to make changes to your converted piece. Click Add Books and select the file from your hard drive and hit Open. To edit your ebook, you can click on the Edit Book button. Then go to Edit Metadata to create the ebook cover by typing in the title, author, etc. Click on the Generate Cover button, keep clicking until you find the color and design you like. Or you can hold down on the Generate Cover button and right-click on Customize Styles. To convert your ebook, click Convert Books and choose the Output Format, then OK.
Click Save to Disk icon to save your ebook file to your computer. You can self-publish ebooks for free through Kindle and reach millions of readers on Amazon. The process takes less than 5 minutes and your ebook will appear worldwide on Kindle stores within 24-48 hours. Sign in to your Amazon account, or sign up if you don’t have one. Click Bookshelf, then Add New Title. Fill out the form that consists of Book Title, Description, and Keywords related to your ebook. Upload the cover file (JPEG), and the book file. Preview your ebook with Amazon’s online viewer and make sure it looks right. Click Save and continue, then go to the Rights and Pricing page. Choose Worldwide Rights and 70% royalty rate before selecting your price. Most ebooks are priced $2.99 – $9.99. Another place where you can self-publish your ebook is at Kobo. Your ebook will be available to millions of readers in over 200 countries and you’re still free to publish your ebook elsewhere. Plus, the intuitive dashboard enables beginners to navigate through it with no problems. So how to distribute your ebook at Kobo? Create a free account at Kobo Writing Life. 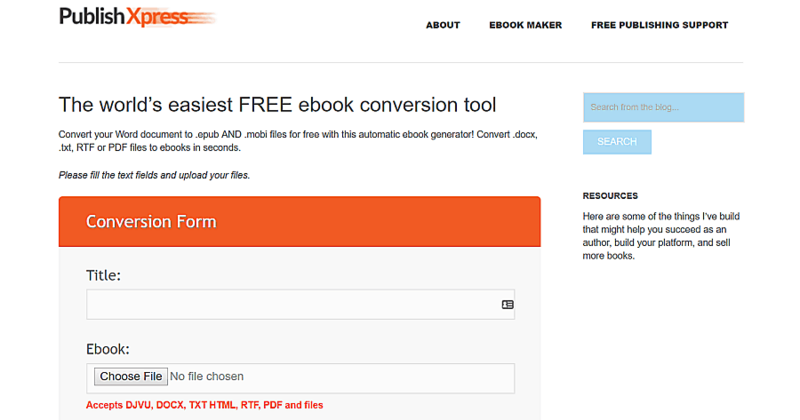 Click ebooks, then Create new ebook. Fill in the required information such as the ebook title, the author(s), language, and the synopsis. Press Upload your book cover and select a JPG or PNG file. Go to Add ebook content and upload your ebook file (DOC, DOCX, OPF, EPUB, MOBI). Proceed to Rights and Distribution to determine your license and availability. Then set the price of your ebook. Once all the steps above are done, the Publish your ebook option will be available. If uploading your electronic book directly to retailers is too much of a hassle, the Smashwords is your solution. Smashwords is the world’s largest electronic books distributor that will help you reach multiple global retailers in an instant! With their central metadata management, you’ll be saving a lot of time. Make a free account and confirm your email. Read through the Smashwords Style Guide and edit your manuscript to suit their format. Click Publish and simply follow the steps provided to upload your book and cover. Publish your ebook and earn money! So seize the opportunity, and create your ebook now!